JESSICA SHIEFAUER’S THE BOYS (POJKARNA) HAS BEEN LONG LISTED FOR THE PRIZE ‘FOUND IN TRANSLATION’ LAUNCHED BY RIGHTS PEOPLE. The Boys is an account of the coming of age years like no other. It combines the painfully everyday with the beautifully magical and tells a dark intense tale of love, death and sisterhood. 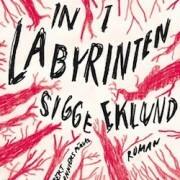 The Boys (Pojkarna) was awarded The August Prize in 2011 for best young adult fiction. The boy kingdom is introduced with the acuteness and assertiveness of the girlhood eye. A coming-of-age novel that endeavours to dissolve the borders of language, maturing and reality. About the body as a battlefield and masculinity as a drug. The novel was nominated for the Nordic Council Children and Young People’s Literature Prize 2013, a play based on novel is touring in Sweden and a movie is in the making. 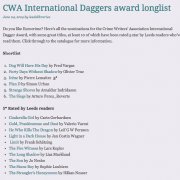 Found in Translation, a new prize for translated children’s fiction, to find fresh, unique and fantastic stories for children and to make those accessible to all editors and publishers interested in the best books for children. A professional literary translation samples of the winning titles will be included in the FOUND IN TRANSLATION anthology. The winners will be announced at the Bologna Book Fair 2015.
http://www.nordinagency.se/wp-content/uploads/2014/02/awards.png 500 500 Anna Frankl http://www.nordinagency.se/wp-content/uploads/2014/02/new_logo.png Anna Frankl2014-06-30 13:25:152014-06-30 13:27:40JESSICA SHIEFAUER’S THE BOYS (POJKARNA) HAS BEEN LONG LISTED FOR THE PRIZE 'FOUND IN TRANSLATION' LAUNCHED BY RIGHTS PEOPLE. 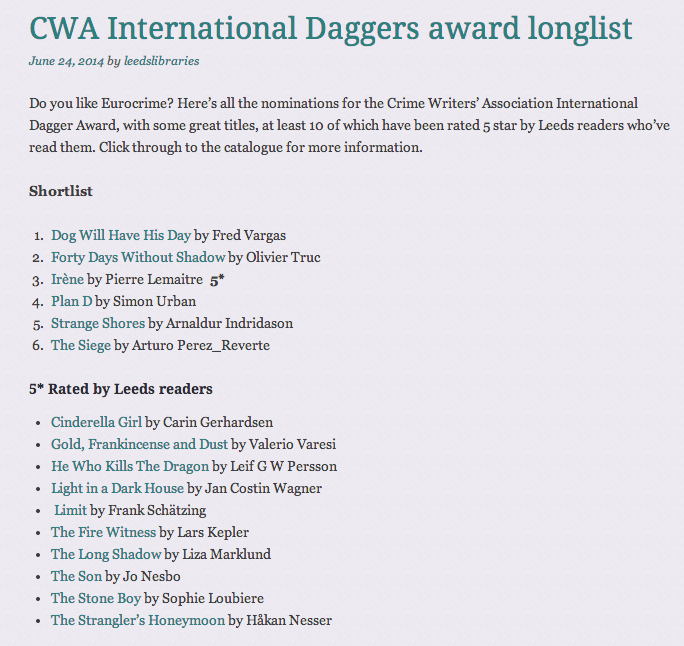 UNNI LINDELL’S THE SUGAR DEATH (SUKKERDØDEN) HAS BEEN SHORTLISTED FOR THE ITALIAN LITERARY AWARD IL PREMIO ROMA. 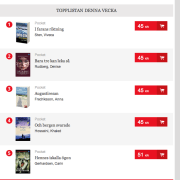 Unni Lindell is one of the very best selling authors in Norway, always at the top of the bestseller charts with her books. Her crime series has been translated into more than 15 languages and adapted to a popular TV-series. The Sugar Death is the second book in the successful series about Inspector Cato Isaksen and Marian Dahle at the Oslo Police. The far from frictionless relationship between Cato Isaksen and his younger colleague Marian Dahle is depicted with psychologically convincing detail and the plot is as ingenious as rich and suspenseful. The winner will be announced on July 10th at a ceremony in Rome. 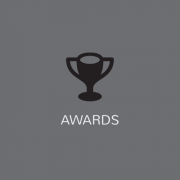 http://www.nordinagency.se/wp-content/uploads/2014/02/awards.png 500 500 Anna Frankl http://www.nordinagency.se/wp-content/uploads/2014/02/new_logo.png Anna Frankl2014-06-30 13:20:102014-06-30 13:20:10UNNI LINDELL’S THE SUGAR DEATH (SUKKERDØDEN) HAS BEEN SHORTLISTED FOR THE ITALIAN LITERARY AWARD IL PREMIO ROMA. 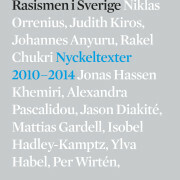 Journalist and crime author Carina Bergfeldt is proud to contribute her text on the Utøya massacre to Natur & Kultur’s anthology Rasismen i Sverige – Nyckeltexter 2010-2014 (Rasism in Sweden – Key Texts from 2010-2014). Editors Devrim Mavi and Lawen Mohtadi have collected the most important texts the have been written during the 2010th Century. 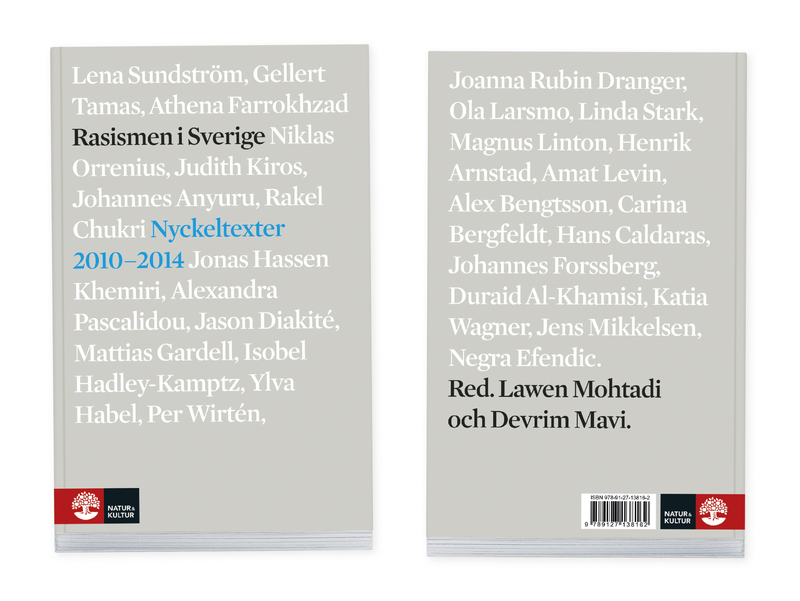 Texts about the present, Sweden, Reva, Utøya, racial stereotypes, a nationalistic party making inroads in Swedish parliament, illegal registration of Romanies, and much much more. The book will be out in the middle of august with some new texts and the most important texts that started the debate. Don’t miss this vital collection, a must read for everybody. 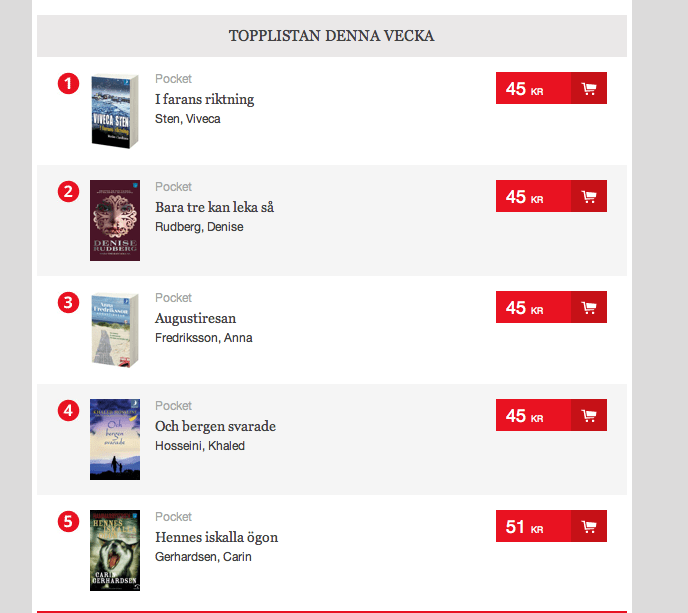 Carin Gerhardsen’s MAMMA, PAPPA, BARN (Cinderella Girl) was rated with five stars by readers at Leeds Library and Information Service. Congratulations! http://www.nordinagency.se/wp-content/uploads/2014/06/Skärmavbild-2014-06-25-kl.-08.43.53.png 613 688 Nordin http://www.nordinagency.se/wp-content/uploads/2014/02/new_logo.png Nordin2014-06-25 09:24:372014-06-25 09:24:37Full of Nordin Agency's authors!